Direct walkin on 17th July ! 5. Liv.AI is hiring Trainee Verifiers. WALK-IN Interview on Monday ( 17th July 2017 ) after 11 am. Job- You will be given few audio clips, you will have to listen to the clips and type and verify. Candidates who know English and any one regional language to read and write (Kannada, Telugu, Hindi, Tamil, Bengali, Malayalam, Gujarati and Marathi ) which is compulsory can apply for this job. Any Degree, Any undergraduate, Any Qualification is fine. 6. DXC Technology(Formally known as HP) Hiring for Assistant BPS profile! 13. Genpact hiring for Technical Support profile ! 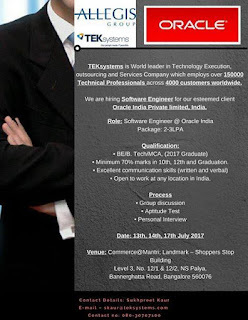 Walk-in interview for English/Kannada/ Tamil / Telugu speaking candidates for voice process on 17th July to 22nd July, 2017 @ 10 AM.